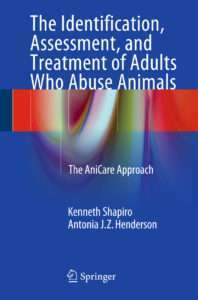 Created in 1999, the AniCare® Model of Treatment for Animal Abuse is the first professionally developed psychological intervention program for adults who have abused animals. AniCare® Child is used to treat offenders under age 17. AniCare® uses a cognitive-behavioral approach with an emphasis on the client’s need to acknowledge accountability for his or her behavior. It involves both assessment and treatment that address seven concepts: accountability, respect/freedom, reciprocity, accommodation, empathy, attachment and nurturance. Materials include a detailed AniCare® Adult Handbook that clinicians use to tailor treatment to the specific needs of each client. ASI sponsors virtual and in-person workshops to train social service professionals in the use of AniCare®. We also offer trainings for professionals in other disciplines (e.g., law enforcement, education, criminal justice) on how animal abuse may affect their work and provide useful information about how awareness of the relationship between animal abuse and other antisocial behavior can be integrated into practice. Purchase the AniCare® Adult Handbook here.